Door Jan Wester (geboren 1930) Deze feedback is in het Engels in verband met de vele buitenlandse vrienden van deze klant. Going on a safari in Africa was a dream that I had for many years. In 2008 I planned a trip to Kenya /Tanzania that had to be cancelled because of political troubles. Instead I went to Brazil as an eco-volunteer to participate in a research project on river otters, set up by Brazilian biologists. But finally the African dream came true. However, it took quite some time to find the right organization. The well known travel firms did not offer what I wanted . So I turned the question around and told some smaller firms specialized in Africa what I was looking for, that is; small parties, professional guides, camping out in the bush, seeing many animals and few other tourists. As a result Out in Africa came up with a specialist safari from Botswana. They turned out to be an excellent choice. 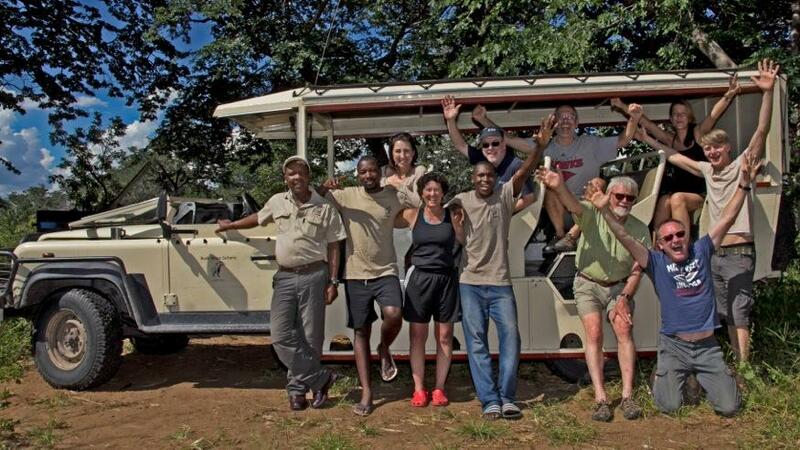 They offered a 17 days camping safari covering the Kalahari Game Reserve, the Okavango delta and the Moremi and Chobe national parks, all known for their richness in wildlife. The tour ended in Livingstone/ Zambia a few miles from the famous Victoria Falls. I considered 17 days too short to fly all the way to Africa. So I stayed another week in Livingstone, because of the fact that it is one of the few places where you can easily organize day to day activities on an individual basis. Unfortunately Elly decided not to come, because she is allergic to group travel, neither does she like the heat nor long distance travel in cars. Beginning of March I flew to Johannesburg where I overnighted and then on to Maun the gate way to the Okavango, where I was met by the safari people. Since we were leaving for the Kalahari early next morning, we went straight on to a shopping centre to buy water and other drinks for 5 days ( the only thing not included in the tour price). The night was spent in a romantic lodge on the banks of a river. I had a nice hut with a thatched roof . I met the rest of the party at dinner ; 3 man from Germany in their early or late fifties, an American woman and one Dutchman; of course by far the oldest participant. I even had to bring medical declarations that I was considered fit enough to make this tour. I cannot blame the organizers. They only see your age on a registration form and it is understandable that they worry about the problems they might run into with a 81 year old grey bard. Our staff are all from Botswana; our guide/driver Evan (45), 20 years of experience in the bush, Chris our cook and a trainee cook who could join because we were such a small party. Early next morning we board our safari vehicle that will be home for the next 2½ weeks. It is an extra wide, long wheelbase Landrover. There are 4 benches behind each other, seating 3 persons each, so there is place for max. 12 passengers offering 8 open side seats for unobstructed views The size of our party therefore allows everyone to have an open side seat and no one has to sit in the middle. The folding front wind screen provides natural cooling while driving. There is a roll up canvas roof that allows you to stand on your seat and have 360* free view, though most of the time we needed the roof for shade. There were perspex windows that could be fitted for cold or rain, but we had no need to use them. A fridge allowed everybody to have some cool drinks at hand and the kitchen trailer also transported all our camping gear and luggage. Camera batteries could be loaded using an adapter on the car battery. Botswana is a relatively unknown country so some details may be of interest. It has the size of France (or Texas) , so the 2 million inhabitants have a luxurious amount of space. It is bordered by South Africa, Namibia, Angola, Zambia and Zimbabwe (former Rhodesia). 50 % of the population is settled in urban areas. The capital Gaborone (250.000) is in the south-east. The official language is English. Setswana is the national language but there are lots of other languages spoken by different ethnic groups. In 1966 former British Bechuana land became the independent republic Botswana. It was at that time one of the poorest countries of Africa. It has managed to do better than its neighbours. The government preaches austerity and diligence. Corruption, racism, civil war and money wasting prestige projects are almost unknown. In this turbulent region the country has been described as ‘an island of common sense in a ocean of confusion. ” Main sources of income are diamonds, tourism and B. is the biggest meat exporter of Africa. The latter was clearly visible when we drove south to the Kalahari, lots of cattle grazing on the road sides and in the fields as well as goats and donkeys. Later that day we entered the Kalahari Game Reserve (size 55.000 km2 that is 1½ x the Netherlands). During the 5 days there we saw 4 other cars on the horizon and two that we actually met on the same road. I had imagined the Kalahari to be a desert more or less like what I saw on my Sahara expeditions, but this part is more like a savanna with yellow and green undulating grasses, isolated patches of trees and sometimes a bigger wooded area. The real desert seems to be more in the south-west and Namibia. We see the first springbokken and interesting birds like various vultures, yellow head kite (geelbek wouw) and the koro-bustard (reuzentrap) a 135 cm. high bird that walks dignified and flies reluctantly. Our first campsite is nicely wooded. We all have a large dome tent to our own (small party), 175 cm. high with 4 large mosquito-netted windows. The tents are difficult to put up on your own, so we form duo’s to put them up together. During the whole tour food is cooked on a campfire, which creates the real safari atmosphere and keeps animals away. In the afternoon we are met by a group of 2 Bushmen and 2 Bushwomen. They wear an antelope skin around their waist and in addition the women have a cloth around their shoulders. These most ancient inhabitants of Africa that are now almost extinct, will take us on a tracking in the bush. They are masters of survival. Soon the men start to dig because they recognized some small leaves of a plant that grows edible tubers. The digging is done with a stick and the tuber is at least 50 cm. deep so it takes some time, but it is worthwhile. The thing is at least 3 or 4 kilos! It disappears in a leather carrying bag of one of the women. Later in their camp we all get a piece of it to taste, quite nice, like a mild radish. After a fire making session and some dances we go back to our own camp. For me this visit had a tragic flavour, because it confronts you with a 10.000 year old culture, full of unique wisdom and knowledge that is on the verge of disappearing for ever. I would have liked to spent some more days with these fascinating people. The campsites we use in the bush are neither equipped nor fenced off. It is simply a place designated by a board nailed to a tree. This first one is pure luxury because it has an eco toilet building. According to our guide Evan there are several lions around in the area. We get instructions to always shine around with a flashlight when leaving the tent for sanitary or other reasons. Fluorescent reflection of animal eyes tells you they are around. Never run, but retire slowly! Not everybody seems convinced! But Evan is right later on in the night I hear lions roar in the distance. Exciting! The usual routine is rise at 6, breakfast 6.30 , start game drive at 7. After a few km. we are suddenly surrounded by a herd of springbok. They have white faces and a delicate black line from eyes to nose. I am so impressed that I forget to take pictures. More wonders are following, like yellow billed hornbill (geelbek neushoornvogel), Red Hartebeest, a large antelope with lyre shaped horns; bat-eared fox (woestijnvos). Then our way is blocked by big herds of Oryx or Gemsbok, a large, mainly black and white, antelope with long straight horns. Around 10 o’clock we usually have a fruit stop (apple, pear or orange). Evan preferably selects a spot with low grass and unobstructed view so we cannot be ambushed by lions or other predators. Rightly so, most of the grass has the exact colour of a lion; it just has to lay down to become invisible. We drive on under the vast African sky in endless wide open spaces with only animals and no humans. What a fantastic change from overcrowded Holland. We see the first giraffes, they are really tall but also, small animals are interesting, like the funny ground squirrels that use their big, fluffy tail for shade. Suddenly 3 ostriches (struisvogels) run away, their feathers flared like ballet skirts around their massive dancing legs. They are not even out of sight when we are surrounded by hundreds of gnus or wildebeest. I sometimes have to pinch my arm to be sure I am really here, seeing all these beautiful animals. Our next campsite is under a patch of trees in an endless savanna that spreads out till the horizon and beyond. After dinner I walk out of the light circle of the camp to enjoy the stillness of the African night under a sky filled with millions of stars. My favorite constellation, Orion is clearly visible as well as the Milky Way. African nights in the bush are filled with mysterious sounds; the bark of a jackal, the call of an owl, the roar of a lion, the chirping of crickets. Therefore a safari day trip returning to a lodge every evening can never bring the same emotions as camping out in the wilderness. The next morning we do not have to take down tents, we stay here 2 nights. Chris and his helper stay in camp. The highlight of the day starts when we meet up with a giant lion, who comfortably rests on the roadside a and stays there also when we get closer. And he is right, why should the king of animals give way. Evan slowly gets as close as 5 m. from him. He explains that lions see the vehicle as one single unit and do not identify passengers as individuals. We observe him for at least 10 min. He stares at me with a penetrating look in his beautiful amber coloured eyes. A little further we discover the rest of the pack; 3 lionesses, a young male and a cub. It feels unreal to be so close to a peaceful family of lions for at least 30 min. They seem very much at ease, one yawns, another rolls on her back legs in the air. An unforgettable experience. We are back in camp around 13 hrs for lunch. Afterwards reading, looking at pictures or sleeping till 16 hrs when we start again in search of wildlife till about 18.30. We meet a couple touring on their own. They have hardly seen any special animals. This clearly proves the value of an experienced guide. Around 22 hrs. most of us go to sleep. I played my mouthorgan for a while, which earned me enthusiastic reactions in the morning. We reach the next campsite around mid-day. Putting up tents in the heat is a sweaty job, but we have our open air shower tent; 4 poles with a canvas around them and a big water container with a tap that hangs from tree branch. Toilet tent same idea, with a hole in the ground and a toilet seat over it. The site is superbly located close to a lake and we enjoy a spectacular sunset. Behind my tent there is an arm of the river and during the night I can hear crashes of hippos cutting through the papyrus knots, huffing and puffing with delight. So close they were that I heard them munching away their water lilies. ting discussions around the campfire. Also in Chobe N.P. we are constantly surrounded by big herds of elephant, buffalo and impalas. One night there is consternation in the camp, hyenas are looking for food around the kitchen trailer. We follow the Chobe river that meanders trough a vast flood plain ,offering spectacular views. Highlight is when we see a leopard climbing a tree with a just killed impala. What amazing power, the prey is as heavy as the hunter! Comfortably installed on a branch he starts his meal. We are so close you hear the bones crack. The last night in the bush Evan asks all of us personally if we have been afraid. It turns out that most had been so at certain moments. My answer was: ”My only fear was and is, what is the future of all these free animals. Will we allow them the place to live in a world increasingly overpopulated by humans? For me this safari was a life changing experience.” The next morning we head back to what we call ‘civilization’. Suddenly there are cars, lorries and traffic lights. We cross the mighty Zambesi on a ferry boat. On the other side is Zambia. It takes an hour to get trough customs. In Livingstone we stay in a beautiful lodge, situated in a lush tropical garden, with huts scattered between flowers and trees. The next morning I say goodbye to my fellow travelers. I have the good fortune of staying here for another week, doing amongst others an ultra light flight over the Falls, canoeing on the Zambesi, walking with lions and cheetah’s, an elephant ride in the bush and a jungle day walk.